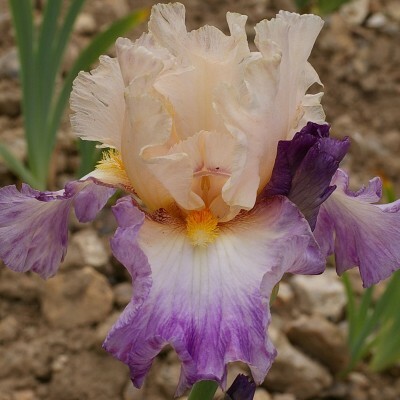 Off-pink white standards toned in light lavender at the base ; falls of a soft bluish lavender with white beards tipped with tangerine. Beautiful branching with 8-10 buds/stalk. A most delicate tone combination! 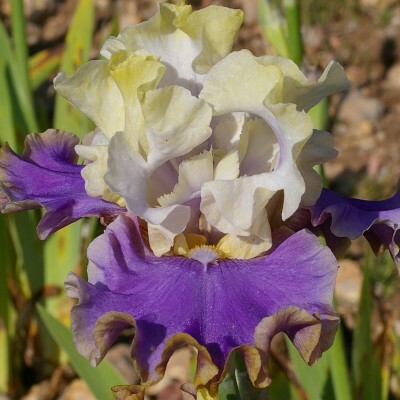 New bicolour that combines many qualities: charm, perfect shape, long flowering, 9 to 12 buds, great vigour. 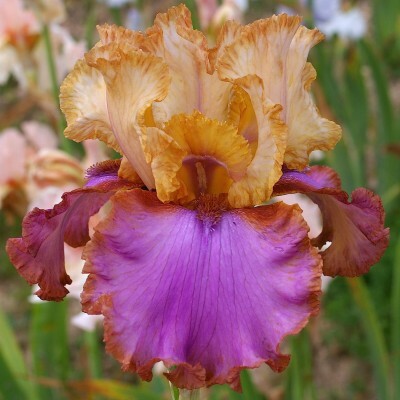 Pinkish apricot standards, soft rosy lavender falls much paler around the tangerine beard. 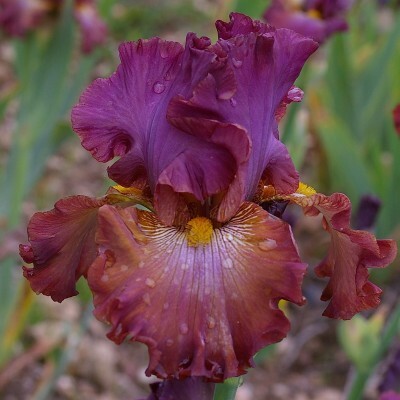 Quite rightly it won first prize at the Florence iris competition in 1996. 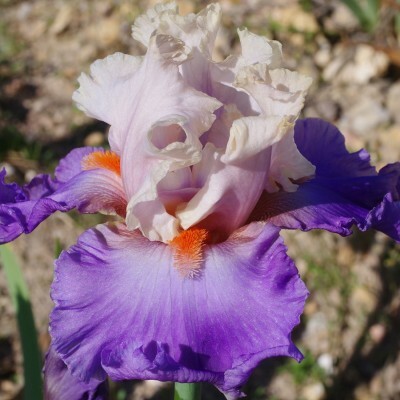 A most unusual two-toned iris ! Magenta standards infused with purple toward the centre. Ochre red falls, paler toward the bright yellow beards. Flowers of gorgeous shape (7-10) standing on very tall stalks. Unusually warm and appealing! 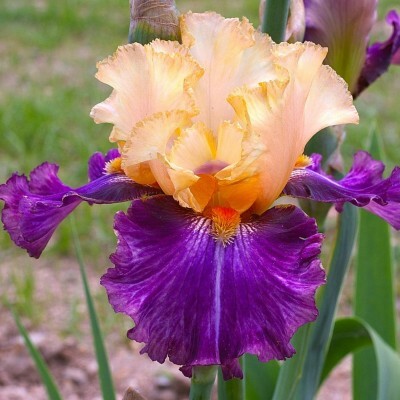 Large blooms with light apricot standards framed with nearly horizontal purple and aubergine-violet falls adorned with a line of light lavender-rose down the middle (2.5 mm wide). Mandarin toned beards. 8 to 10 blooms on average. Salmon beige standards and ruffled rosy-tan falls washed fuchsia-orchid. Fiery tangerine beards. An unusual combination of soft tints. 8 to 12 buds per stem. 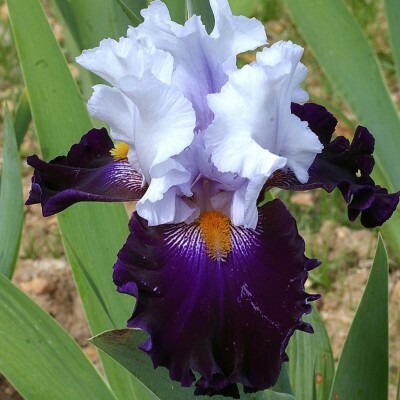 Prizewinner for the best new colour at Florence in 1997. Very wavy, white standards tinted with lavender, very dark purple, velvety falls and brown beards. Lovely 3-branched stems regularly sporting 8 to 10 buds. Healthy, vigorous foliage. 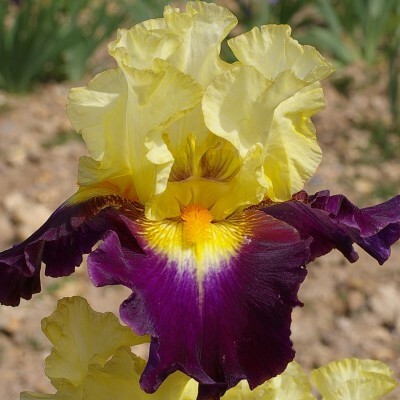 A very big bicolour with butter-yellow standards and very dark violet-purple falls, with a big cream "throat" around the yellow-orange beard. Despite the moderate number of 6 buds, the arresting contrast offered by "Funambule" makes it an excellent new variety. 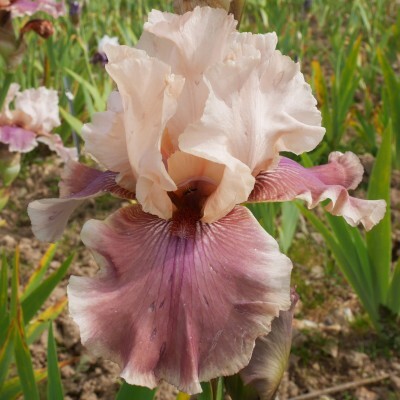 We are delighted to name this new unusual bi-colour "Gérard Brière" after the founder of the iris garden Brocéliande in Brittany. 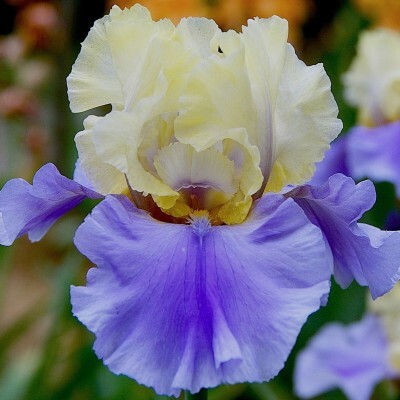 Amber-yellow standards, tinted brown at their edge, and blue-violet falls with a large white centre and bright yellow long beards. Multiplies up well, unusual colour. Entirely new: large flowers with pale blue standards and greenish yellow falls. Orange beards. A very unusual contrast similar in style to the standard dwarf "Real Coquette". Very attractive and easy to place in mixed borders. Late and prolific flowering. (9 buds per stem). 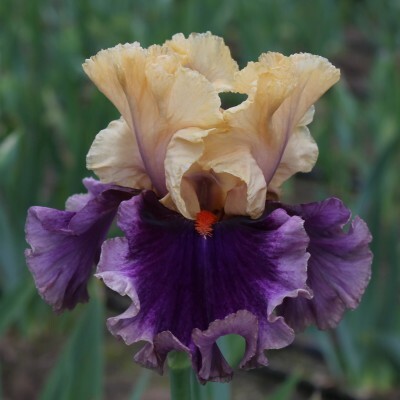 We crossed two Dykes Medal winners ("Edith Wolford" and "Honky Tonk Blues") to get this magnificent and waved bicolor. 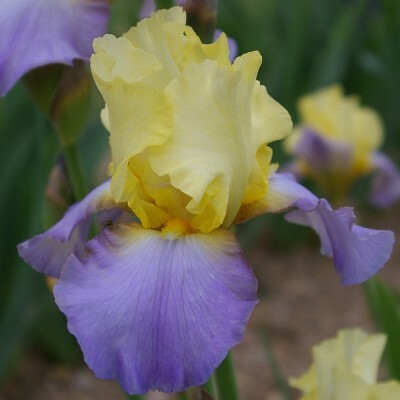 Clear butter yellow standards and cool bluish lavender falls with almost invisible beards. For us, it is one of the best blue and yellow bicolors. Aiming for green amoenas: standards between lavender white and greyish white. Light tawny falls tending toward green. Brownish orange beards. 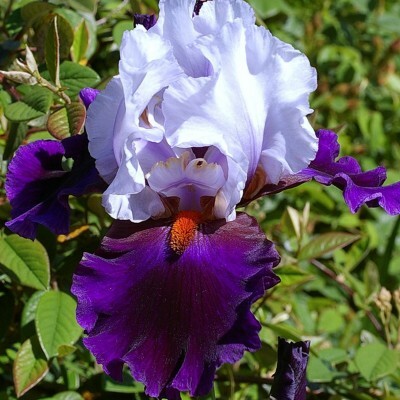 On average 9 large, frilled flowers. Excellent branching. 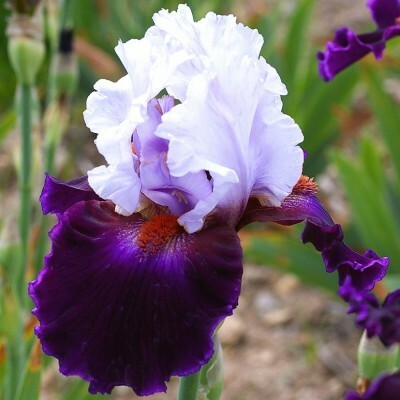 Imposing flowers (16 cm) gently ruffled and displayed on strong stems (8 buds). Creamy buff standards and flared rosy cerise falls. 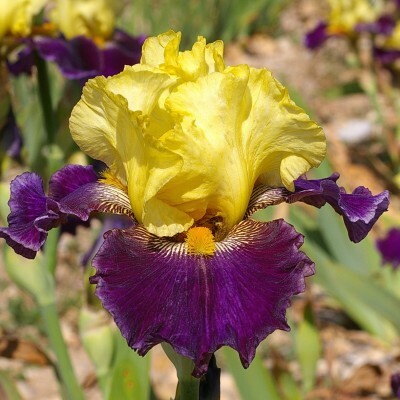 Yellow beards tipped with lavender. 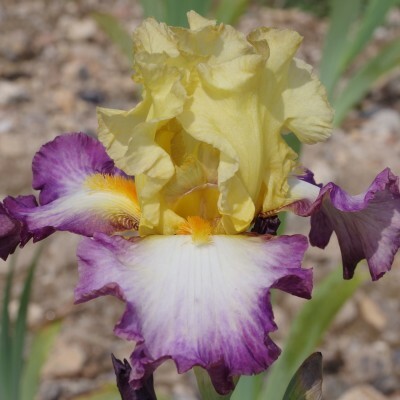 Resulting from the cross between 'Ciel gris sur Poilly' and 'Macaron', this is a two-toned variety with yellow standards and amber borders which contrast with nearly horizontal, sustained bright purple falls. Orange beards. Average-sized and beautifully shaped flowers which are compact and undulated. 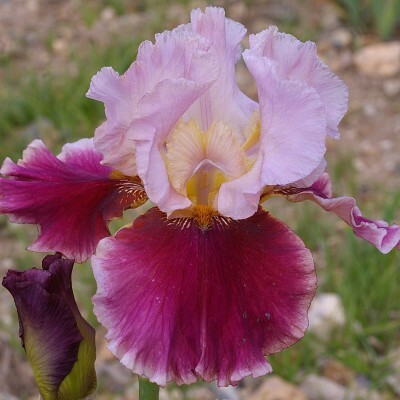 Slightly smoky-pink standards and falls that veer between medium lavender and clear violet with bright red beards. Unusual and attractive combination! In the style of its father "French-Cancan" but of a different intensity. Flowers moderately ruffled and 8 buds. 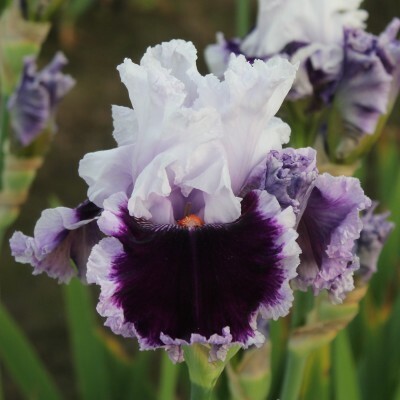 Very attractive son of our excellent 'Magnétisme' with pale lavender blue standards and velvety falls of a deep purple featuring a lighter border. «Burned-red» beards. Quality stalk which carries 7 buds on average. 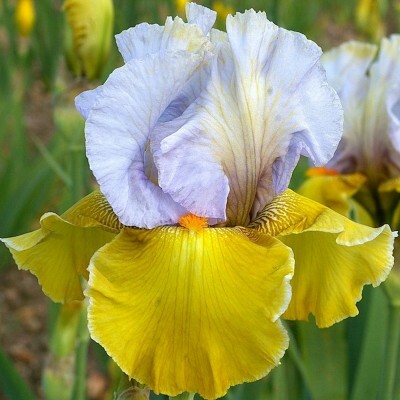 This new and luscious combination carries numerous elegantly ruffled flowers (11 on average) which feature medium-sized standards. The nearly horizontals falls of amaranth, with borders which turn to a light pink copper tone, are nicely echoed by bronze-coloured beards. We are pleased to have named this exquisite variety in memory of Madame Tardivier, former director of the Jardins des Tuileries at the Louvre. Harmonious combination of pastel tones! Standards between cream and apricot. 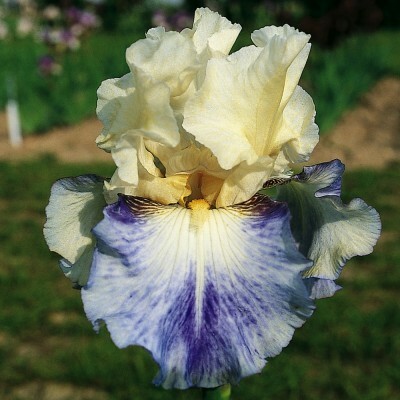 Strongly ruffled falls, coloured in cream lightly toned with apricot, edged with a light purple border. Vivid scarlet beards. Salmon pink standards on pinkish purple falls. Bright orange-red beards on a paler zone. Tall and well-branched stems. Another interesting characteristic: it blooms late. 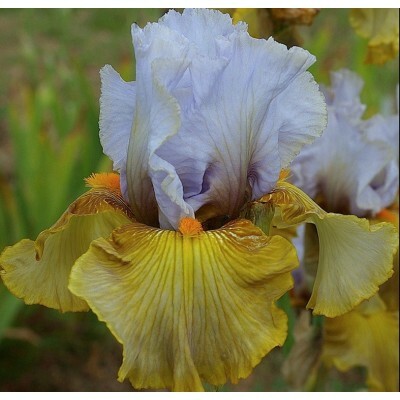 Its parents "Mystérieux" and "Funambule" have passed on their great depth of colour tones. 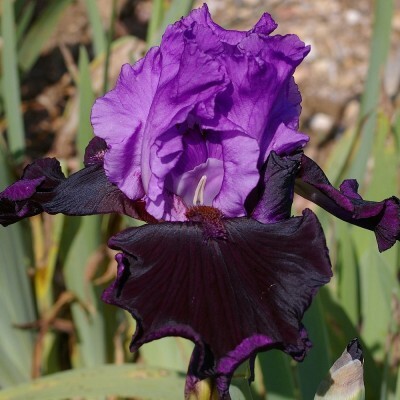 Thus the strong plain black-violet falls offer an excellent contrast to the bluish-white standards. Bronze-orange beards. Very good body, tight ruffles and strong stems. Chamois-coloured standards infused with plum red at the centre. 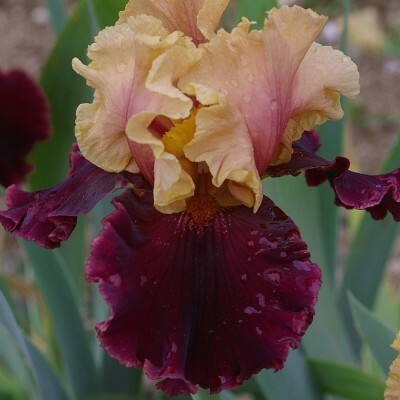 Velvety, very dark burgundy red falls, a little paler at the edges and Rust red beards. Quite ruffled flowers with slightly crimped edges. Interesting contrast. So chic! 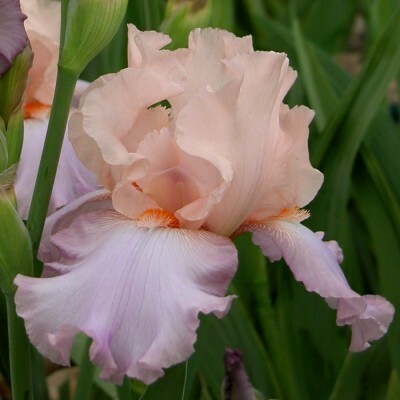 Pink standards with hints of lilac, falls with creamy-pink centres and very wide violet-purple borders. The long beards stand out in their coral hues. An unusual colour combination. 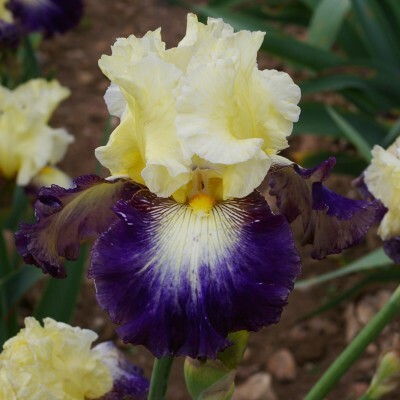 A rare bicolor featuring pale lavender-blue standards with falls of yellow with a hint of ochre or golden yellow and thin but neat white ruffles. The orangey-yellow beards are very subtle, almost going un-noticed. 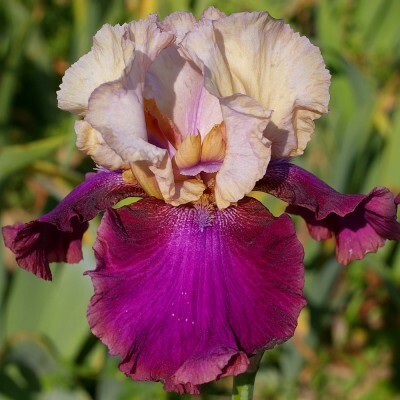 The combination creates a really interesting contrast for this prolific specimen. You can expect an average of 8 buds per stem. 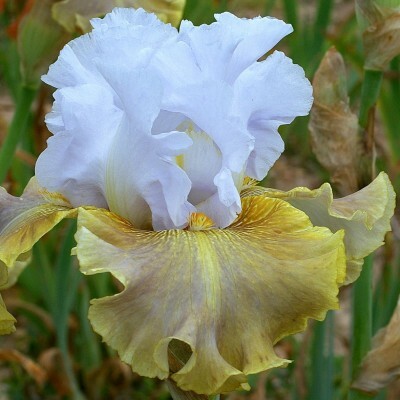 This variety shows a nice blending of sky blue and ivory tones. It has creamy white standards and white falls with mid-blue streaks and paler blue wash. The beards are white tipped yellow. "Seakist" blooms late and is very floriferous. Simply gorgeous and most decorative ! 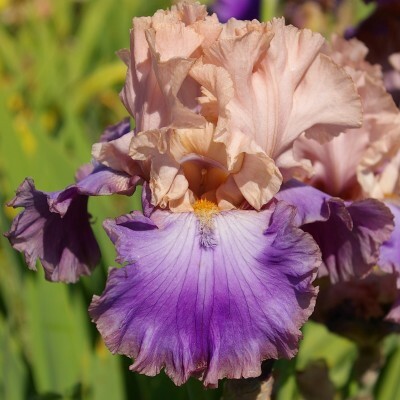 Medium orchid pink standards in strong contrast with very large, practically black falls with a velvety feel and silvery hues. Beards are a purplish brown. Here is the superb descendant of our excellent "Noctambule". 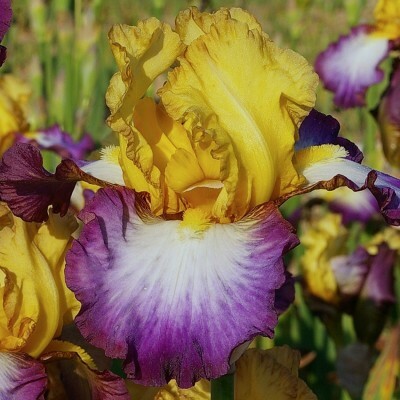 Yellow standards with slightly amber edges stand above the plum-violet falls with their orange beards framed of bright-yellow, which creates a lively and vivid effect. The magnificent low branching stalks carry an average of 8 buds. 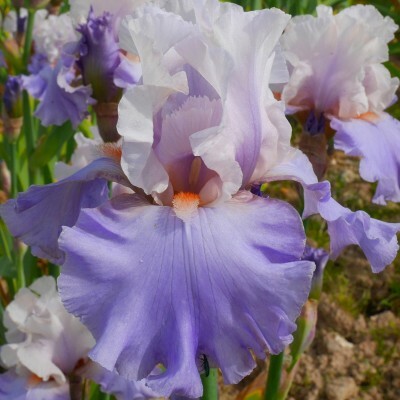 Lovely colour combination and excellent contrast: Light lavender-blue standards with a hint of bronze at their base. Deep sulphur yellow falls with a narrow white rim and orange beards. Lightly ruffled.